It is unlawful for any person to transport, purchase, possess, or sell walking catfish (Clarius batrachus) or the white amur or grass carp (Ctenopharyngodon idella) or live northern snakehead fish (Channa argus) or blotched snakehead fish (Channa maculata) without the written permission of the Director. Delaware’s freshwater trout program is a self-supporting put-and-take fishery in selected New Castle County streams and Kent and Sussex County ponds. Revenue generated from the sales of trout stamps is used to purchase rainbow, brook and/or brown trout for stocking. Summer water temperatures limit trout survival and reproduction in Delaware waters, so stocked fish are meant to be taken, but may be released at the angler’s discretion. Season / Hours – The 2019 freshwater trout season at Tidbury (Kent County) and Newton (Sussex County) Ponds opens at 7:00 a.m. on Saturday March 2, 2019. The 2019 freshwater trout season in New Castle County opens at 7:00 a.m. on Saturday April 6 , 2019. No fishing is allowed in designated trout streams or designated trout ponds (Tidbury & Newton Ponds) two weeks (14 days) prior to the scheduled opening of the trout season. It is unlawful to fish for trout in designated trout streams or designated trout ponds between one-half hour after sunset and one-half hour before sunrise. Trout Stamps – A trout stamp is required to fish in a designated trout stream from the first Saturday in April through June 30 and from the first Saturday in October through November 30 unless exempted by law. A trout stamp is also required to fish Tidbury Pond in Kent County and Newton Pond in Sussex County from the first Saturday in March through April 1. Stamps are available online in electronic form, or a printed stamp may be obtained at DNREC Headquarters (89 Kings Hwy, Dover). All stamps must be signed across the face to legally trout fish. Purchasers of electronically issued stamps may obtain an original printed stamp by calling 302-739-9918. A stamp will be mailed to you after December 31, 2019. White Clay Creek from a point 25 yards above Thompson Bridge at Chambers Rock Road to the Pennsylvania state line is designated as a fly-fishing only trout stream (restricted trout water). It is unlawful to use any metallic, plastic or rubber spinners, spoons, lures, plugs or natural bait or to use more than two (2) flies on a line at any one time. It is unlawful to possess more than four (4) trout within 50 feet of a fly fishing only section (restricted trout water). Anglers may catch and release trout on these waters as long as the four (4) trout possession limit is not exceeded. 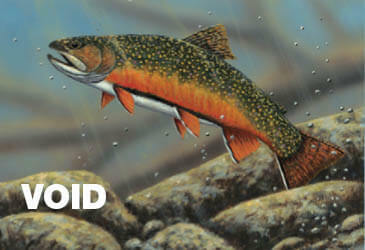 All trout released must be returned to the water as quickly as possible with the least possible injury. It shall be unlawful for any person to possess more than six (6) trout in any one day; except, it shall be unlawful to possess more than four (4) trout in or within 50 feet of any fly-fishing only waters (restricted trout streams). 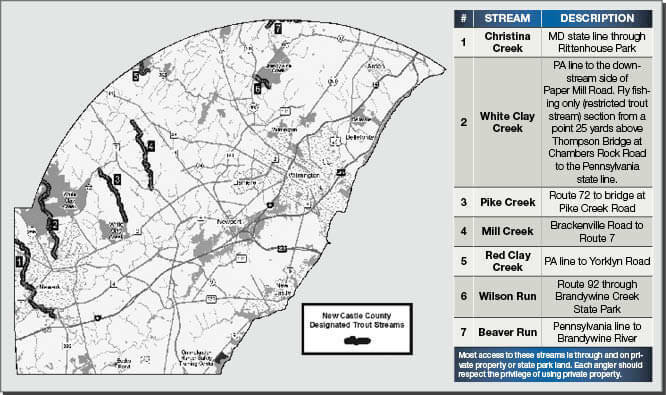 At the time of printing, a proposed regulatory action was underway to change the start time of fishing on the opening day of trout season on New Castle County trout streams from 7:30 a.m. to 7 a.m. This action was approved as final. The opening day start time on trout ponds and streams is 7 a.m.
* Prior to season: stocking includes trophy-sized rainbow trout (14 inches or greater) at all locations. ** April 18 and May 2: Brown trout 11 inches or greater will be stocked at locations listed. *** April 25: Stocking of 12–13 inch and trophy-sized rainbows to prepare for the annual anglers with special needs & senior citizens fishing derby on April 27, 2019 in Wilson Run at Brandywine State Park. For details on the fishing derby, please call the park office at 302-577-3534. It shall be unlawful for any person to stock any species of fish into the non-tidal public waters of this State without the written permission of the Director. This regulation does not prohibit the stocking of private impoundments.